When using a custom wallpaper installation in your home, it's important to keep in mind how the wallpaper will interact with your present decor scheme. But if you're starting over with a brand new themed room, you can purchase your out of the box decor elements to meld harmoniously with your custom wall mural. Take for instance the inspiration room above. Our client wanted to create a desert themed environment that was in keeping with a very popular CG film. 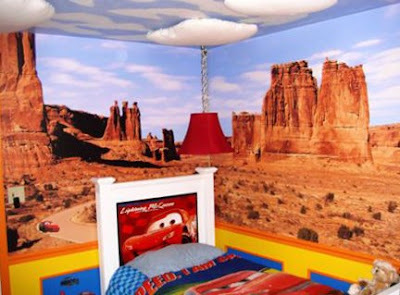 Though we couldn't brand the wall mural with characters from the film, the client easily found mass produced decals to place on top of the wallpaper, getting the scenic effect that was desired, with the characters that his son loved. Above and beyond the wall treatments, the client also brought in other decor pieces and furnishings to fully complete the look. You'll notice in the image that our client also painted out the ceiling to extend the wall mural overhead. In all, this is a perfect representation of the successful outcome of marrying custom wallpaper and store bought accessories. Contact us to learn more about our process and what we can do for your themed room.